7 Key Initiatives In Budget 2014 For Startups, SMEs And Entrepreneurs! India’s Finance Minister Mr. Arun Jaitley announced the Union Budget 2014-15 today and for a change promotion of entrepreneurship in India seemed to be one of the priorities for the new government. It is also heartening to see that this new government has recognized the importance of entrepreneurship as the means for progress for the country. We bring you 7 key initiatives of the Union budget 2014-15 that are focused on startups, SMEs, and entrepreneurs, especially in tech space. The new government wants to push entrepreneurship in India. However, one of the main problems that most entrepreneurs face while starting up is the capital funding that is required. In order to create a conducive environment for this, the budget has proposed to create a Rs. 10,000 crore fund that will act as a catalyst to attract private capital by way of providing equity, quasi equity, soft loans and other risk capital for start-up companies. It is still not clear as to how Govt will utilize this Rs. 10,000 crore fund as no further details have been provided. In our view, the fund may not directly provide monies to the startups, but will be utilized to create a framework due to which startup funding process becomes easier. We will update it as and we get further details on this. The budget proposed to create a technology centre framework that will promote innovation, entrepreneurship and agro-industry. Rs. 200 cr has been set aside for the same. The Govt plans to setup a “Start Up Village Entrepreneurship Programme” that will encourage rural youth to become entrepreneurs. This program will be part of Ajeevika, the National Rural Livelihood Mission (NRLM), which aims to eliminate rural poverty through sustainable livelihood options. The Finance Minister announced launch of a pan India programme called “Digital India”, which will basically ensure broadband connectivity in rural areas, improved access to services through IT enabled platforms, increased production of IT hardware / software for exports and improved domestic availability. Here, Govt will give special focus on supporting software product startups. The budget has earmarked Rs. 500 Cr a National Rural Internet and Technology Mission for services in villages and schools, training in IT skills and E-Kranti for government service delivery and governance. The new Govt plans to setup a new multi-skill training program called “Skill India” that will give emphasis on employability and entrepreneurial skills. The program will offer training for traditional professions like welders, carpenters, cobblers, masons, blacksmiths, weavers etc. India is one of the worst countries when it comes to “starting a business”. The number of procedures to follow and time taken to open a business in India is far too high compared to most countries in the world. With Digital India and numerous E-Governance initiative, it will be far easier for an entrepreneur to start a business as many procedures will be done online and in a transparent manner (hopefully). 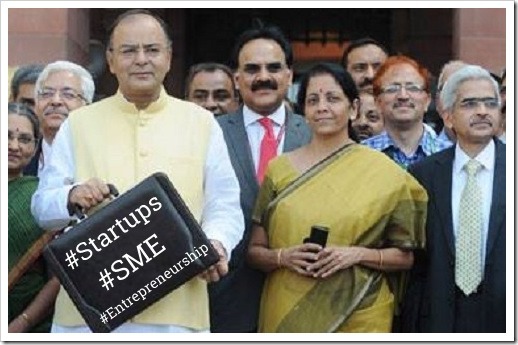 There is no doubt that this budget offers more to startups, SMEs and Entrepreneurs than any of the previous budgets. What needs to be seen is how well are all these initiatives are executed. On paper they look good, but if they are not executed well, it does not mean a thing!